Rowing power exercises can help you to move faster through the water. 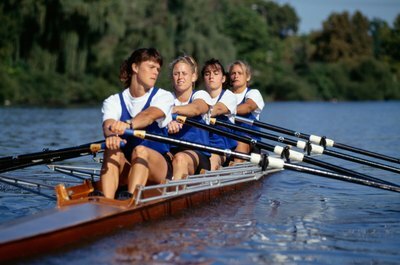 Rowing uses just about every muscle in your body and if you want to row faster, you need to build power. Greater rowing power means each stroke will pull you further through the water at a faster speed. Make people think you have an engine attached to your boat by building more muscle power. You can increase your rowing power by performing a workout called heavy tens. This workout is best performed using an indoor rowing machine. Put the resistance up to the highest setting or very close to it. After you have warmed up, perform 10 strokes as hard as you can. Focus on good technique and aim for 14 strokes per minute. On completion, rest for 60 to 90 seconds and repeat. Perform six to 10 sets in total. Try to maintain a similar power output from one set to the next. Monitor your performance by measuring watts or the distance traveled. Barbells can be used for developing power. Because power exercises must be performed at high speeds, make sure you are thoroughly warmed up before you start working out and select a weight that allows you to move at maximal velocity. A very heavy weight will result in slow movements; if they are too light, you won't experience sufficient overload. Establishing the right training weight may take some experimentation. There are two barbell power exercises favored by rowers: the power clean and the high pull. Both exercises involve squatting down and lifting a weight from the floor to shoulder-height in one explosive movement. In the clean, the bar is caught across the front of the shoulders between repetitions whereas in the high pull, the bar is not held in the top position but rather is quickly lowered to the floor. These exercises replicate the powerful leg drive and arm pull required for successful rowing. Kettlebells are cannonball-like weights with handles that can be swung, lifted and even thrown to develop power for rowing. You can perform power cleans and high pulls with kettlebells. One of the most effective kettlebell exercises, however, is the two-handed swing. It develops hip power, which is an important aspect of rowing. To perform this exercise, hold a kettlebell in your hands and, with slightly bent knees, hinge forward from the hips. Drive your hips forward and use this momentum to swing the weight up to shoulder-height. Lower the kettlebell and repeat. This exercise can also be performed with a single dumbbell. Many power training exercises require access to workout equipment. While barbells, kettlebells and rowing machines can provide excellent results, you can also increase your power by performing explosive body weight exercises. Because the initial drive off in rowing comes from powerful leg push, it makes sense to focus on lower body training if you are limited to body weight exercises as there are no pulling body weight exercises for the upper body to speak of. Squat jumps and jumping lunges are effective leg power exercises and can be performed almost anywhere you have sufficient overhead clearance. Jump into the air from a squat or staggered lunge position and, upon landing, immediately spring into another jump. Perform sets of 8 to 15 repetitions and take 60 to 90 seconds rest in between sets. Do Strong Arms Make You a Better Swimmer? Is Rowing a Full-Body Workout?